Manual clicker press with swing-arm cutting head can perform many types of die cutting with steel rule dies. 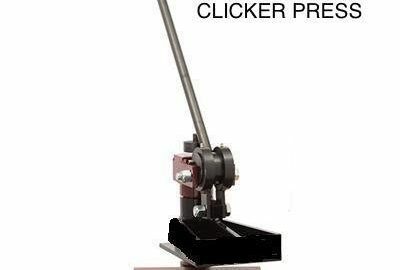 This bench top clicker has been used for leather, embroidery, badge cutting, card stock, magnetic cards, coasters, small plastic shapes, straps and belt ends, clothing, rubber, key fobs, cork, plastic, felt and many other materials. The press requires little effort making operation very easy. The swing arm operation provides the operator with a clear view of the work table (cutting board) making location on printed products a snap. To gain a more correct idea of size place a standard sheet of printer paper (A4) on the desk in front of you, the cutting board is slightly larger than this, any shapes you can fit on this can easily be cut with one hit with the Press! Larger sizes can simply be hit multiple times as the material locks into place after the first hit! Our custom made dies work seamlessly with our press!! Due to the fact we only sell new machines all press sales are final, no returns are accepted.